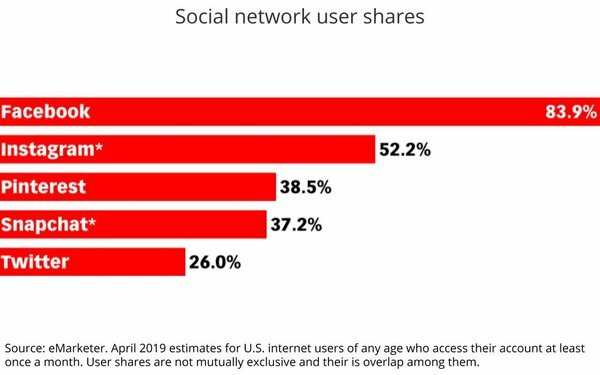 The digital media statsmasters at eMarketer have lowered their user growth estimates for Snapchat following the social network's unpopular redesign. eMarketer projects Snapchat's U.S. monthly users will decline 2.8% to 77.5 million this year from 79.7 million in 2018. The revision represents a significant downgrade from eMarketer's previous projection in the third quarter of 2018, which estimated Snapchat's U.S. monthly user base would expand 6.6% to 90.4 million. 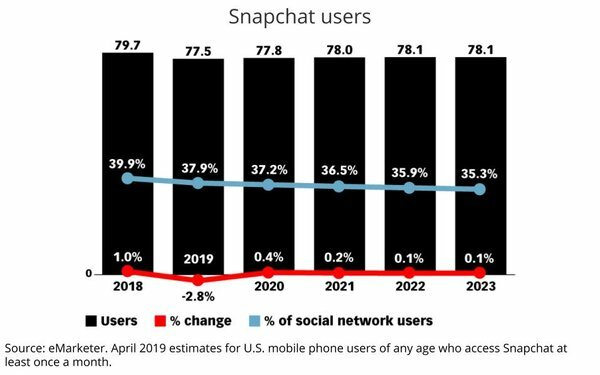 Despite those changes, eMarketer projects Snapchat will have a relatively low growth rate (0.4%), which will lag the expansion of the U.S. social media marketplace (2.4%) in 2020. "The methodology of eMarketer’s recent forecast is flawed. The report does not factor in key recent developments at Snap, such as our revamped Android app, or reference our statement in February that we do not anticipate a sequential decline in our daily active user total in Q1 2019. Its user forecast is more than 10 million off from Snap's publicly available reach on our ad buying tool, its thesis is narrowly focused on the app redesign from over one year ago, and its methodology draws on self-reported survey data that's unreliable in our core 13-34 year-old demographic." "eMarketer’s forecasts and estimates are based on an analysis of quantitative and qualitative data from research firms, government agencies, media firms and public companies, plus interviews with top executives at publishers, ad buyers and agencies. Data is weighted based on methodology and soundness. Each eMarketer forecast fits within the larger matrix of all its forecasts, with the same assumptions and general framework used to project figures in a wide variety of areas. Regular re-evaluation of available data means the forecasts reflect the latest business developments, technology trends and economic changes."